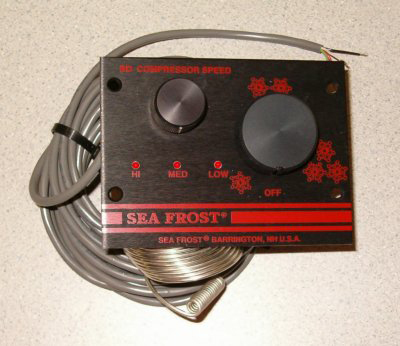 Seafrost | Ocean Options, Inc. The Tradewinds DC incorporates alternate energy into the powering of your refrigerator/freezer system. It is designed to be used with wind power or solar panels, with back up battery power. It is fitted with either holdover or evaporator plates and depending on the model has either ducted air or air/water coolilng. A water cooled option can be added to allow the selection of air or air/water cooled operation. The Tradewinds XP have 30% more capacity for larger cabinets and two plate hookups. The Tradewinds compressor is similar to the BD. Shore Assist units are added to holdover plate systems to maintain the boat's refrigerator/freezer box at a set temperature via a thermostat when the boat is dockside. Tropically rated ducted air cooling is offered on the smaller models (SA-I and SA-II). When the boat is left unattended, air cooling offers reliability over water cooling which could be stopped by weeds and flotsam restricting the water intake. The SA-I is fitted to a single block or single holdover plate. Air cooling is ducted to allow installation in a confined space. 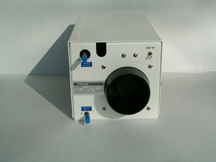 The SA-II is used in multiple plate series systems. Air cooling is ducted to allow installation in a confined space. The SA-III, the largest capacity Shore Assist, is water cooled to maintain a compact size and to allow installation in a confined area. It is used with multiple plate systems and is standard with a twin valve system. The SA-III should be considered over an SA-II in a boat with a generator, as the rate of cooling is faster and greater benefit will result during the generator's operation. Shore Assist systems are often purchases with the Engine Drive. BG systems are high capacity, generator-driven units. The BG 1000 is a 3/4 h.p. water-cooled 110 or 220 volt AC compressor that operates using either dockside power or the boat's onboard generator. It is designed to be installed as a primary system but can be installed with Engine Drive, DC 5000, or Shore Assist, and is best fitted to a boat that uses its generator more than the main engine. The BG 1000 is fitted with a thermostatic control, allowing the boat to be left dockside for extended periods of time while maintaining even refrigeration temperatures. The BG 2000 is a one h.p. 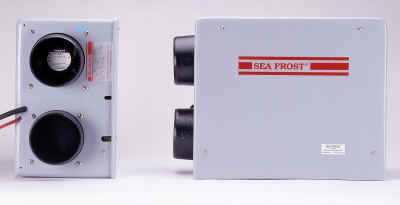 system designed for trawlers and other boats with either onboard or dockside AC power generation. This extremely powerful refrigerator/freezer system mcombines holding plates and refrigerant R-404a for a fast freeze and ultra cold temperatures utilizing generator power when available. This means minimal daily running time and peaceful evenings with no machinery noise. Because ther is no battery or inverter use, larger freezers are possible. Sea Frost's DC 5000 is designed to refrigerate boats equipped with large battery banks and alternative energy systems for battery charging. This direct drive system freezes holdover plates rapidly and maintains thermostatically controlled temperatures by operating on demand from battery power. It can also be operated when under power or generator to freeze holdover plates, eliminating battery draw. The DC 5000 is powerful enough to run a three-plate, twin valve refrigerator/freezer and may be combined with the Engine Drive and/or air cooled Shore Assist for the ultimate in versatility and redundancy. The DC 5000 is a lightweight, compact, one-piece design. 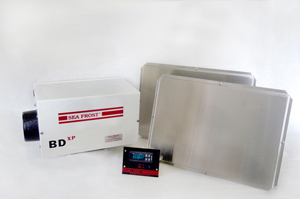 Sea Frost BD Direct Evaporator Systems are advanced design12 or 24 volt DC refrigeration conversion kits, perfect for well insulated refrigerator boxes. The system consists of two components - the compressor, which is remotely located, and a half-inch thick polished stainless steel cold plate which can be mounted on a shelf, wall or ceiling. BD systems come factory pre-charged and require no special tools to install. Dockside the systems operate through the boat's battery charger. Models include the standard BD which utilizes a state of the art, electronically-controlled, variable speed Danfoss® hermetic compressor; and the 30% higher capacity BDxp. Air cooling is standard, a water cooling option allows use of air or air/water. Options include custom plate sizes, custom line lengths, 2-plate freezer systems, freezer bin, remote thermostat, electronic control, air and water cooling and ice-making tray kits. All freezers should be designed with two plates on opposite walls of the cabinet. Holdover plate surface area must be increased over that of the refrigerated space. A spillover system consists of two holdover plates in the freezer section of the divided box - a vent at the top allowing air to circulate between the two. The box is divided by an air tight insulated wall, with a self-contained temperature control air damper (thermodamper) fitted at the bottom automatically controlling the amount of cold air flowing between the two boxes. A return air port is fitted at the top of the divider wall. In a large cabinet, or if the freezer section is not large enough to fit plates to cool both refrigerator and freezer boxes, a series system will be needed involving t wo plates in the freezer and one plate in the refrigerator. In a single valve set up, all three plates are pipes in series. A twin valve system is used where the freezer is not always needed, where the freezer needs more running time than the refrigerator, or where the cabinets are not adjacent to each other. Two zones are created and the freezer, refrigerator or both may be operated. Electric twin valve systems have two separate thermostats. Holdover plate size and piping configurations can be customized for any installation. Information regarding the size of your box, and the insulation thickness and value will allow us to help you design the proper system. Our optioinal, vertical ice-making trays can be used with any refrigerator or freezer application. Designed to expand as the water freezes, the trays hang vertically on the cold plate. Each vertical tray kit includes two vertical trays and splines, mounting rod and clips. For a small freezer within a refrigerator, the stainless steel freezer bin is ideal. Two walls of the Freezer Bin are double sided direct evaporator cold plates which freeze the bin on the inside, creating a small freezer, and refrigerate the cabinet. The bin should be mounted high in the box, either vertically or horizontally, and operates the best in a relatively small, well insulated cabinet. The standard built-in thermostat regulates the compressor to maintain constant temperatures. Other options include a remote thermostat, and a remote electronic thermostat/thermometer, bin lid, and ice making tray kit. Custom widths are also available up to 12 inches. The bin dimensions are H11", W9", Weight is 22 pounds, and the freezer volume is .6 cubic feet. All BD systems feature ducted air cooling. THe four-inch round intake vent is ducted to the cabin to allow the compressor to draw in ambient temperature air. This air is then forced through the compressor box to cool the electronics and pass through the oversized air cooled condenser. Exhausted air exits through the back side of the cabinet ensuring efficient performance even in tropical climates. The BD comes pre-charged with R-134a refrigerant. The copper lines from the cold plate connect to the compressor with brass Aeroquip® connectors which are self-sealing and may be disconnected without loss of refrigerant. The compressor is fitted with SAE-style R-134a service ports. Stainless steel bulkhead brackets are available for mounting the BD compressor cabinet to a vertical wall. The compressor demensions are H7.5",W15"(includes 4-inch air duct),D9", and the weight is 19 pounds. Typical installation requires 1.5 inches behind the compressor, and room for vent hose. The BDxp is the largest compressor in the BD series with approximately 30% greater cooling capacity than the BD. The BDxp should be used in larger refrigerator and freezer applications. The BDxp has an AEO (Adaptive Energy Optimizing) feature. This feature senses the amount of cooling needed and adjusts compressor speed accordingly. 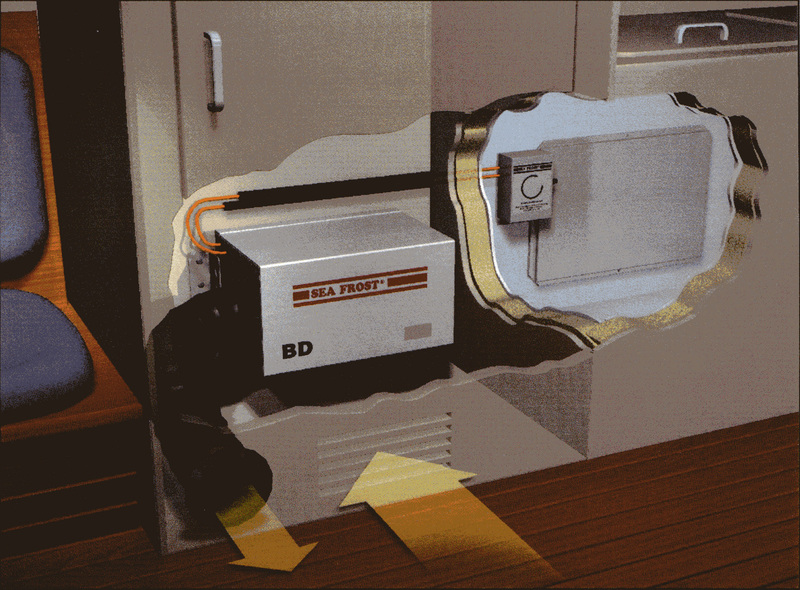 The BDxp may be fitted with a speed control in order to manage power draw. Air cooling a standard: optional air and water cooling is available. Housing size/weight are identical to the BD. The optional remote thermostat is panel mounted. This control allows adjusting the temperature or switching on/off of the BD without having to open the box. The thermostat must be mounted within 50 inches of the cold plate. Remote Thermostat dimensions: H3.5" W3.15"
The ETT is accurately controls the cold plate temperature as well as displaying the interior cabinet temperature. The LEDs indicate standby and run conditions. The ETT offers accurate operating settings. The programmable differential increases efficiency. Fitted with wired sensors, the ETT control may be installed any distance from the refrigerator cabinet. It requires 2.5 inches behind its mounting panel. When ordering, specify 12 or 24 volt. ETT dimensions: H3.5" W4.6"
The BD speed Control can be added to any BD system to change the compressor speed. Speed can be adjusted for cooler weather and will reduce cycling of the compressor. Slowing the compressor reduces the cooling rate, lowering amp draw and reducing battery wear. This also allows energy draw to be matched to solar panels or windmill output. LEDs indicate the compressor operation and speed. The BD speed control should be used with the standard thermostat or with the ETT. BD Speed Control dimensions: H3.5" W3.15"
BD Speed Control/Thermostat combines the remote thermostat with a speed control. The thermostat must be mounted within 50 inches of the cold plate. BD Speed Control/Thermostat Dimensions: H3.5" W4.6"
The insulated cabinet is a big factor in the success or failure of a refrigeration system. Heat leaks into a chilled box. This heat is what must be removed on a continuous basis. Energy usage or compressor amp draw is all based on the amount of cooling needed (heat leaking in). This energy usage is based on box size, the insulation type and thickness, and the climate the boat is in. Heat travels into the cabient from all directions so it is important to have a well insulated top and lid. Cold air will flow like water. All drains need to be plugged to prevent losing cold air. Lids require good air seals. Inside a refrigerated box, temperatures will be lower at the bottom. Mounting a cold plate at the top dools the warmer air and the box more evenly. Sometimes fans help even out the temperature. Air is the medium that transfers the cooling from the cold plate to the food. Shelves should be vented to allow air to flow. A grating or baskets should be used to allow air to flow around the food. This is important in a freezer. Packing a boat refrigerator may require putting the lettuce at one end away from the cold plate and the b eer rand milk at the bottom or near the plate. Frost build up on cold plates will reduce the efficiency of the system. This frost is a product of humid conditions and wet products being refrigerated. * For 24 volt operation, divide all amperage figures by half. Compressor efficiency is about 3.5 to 4 BTU per watt in tropical climates. The BD compressors are variable speed; at low sppeds there is amp draw but a low cooling rate. HIgher compressor speed results in more cooling but more amp draw as well. Amp draw is therefore directly related to the amount of cooling being produced and is not the way to compare system performance. A 2.3 CUbic foot (16' x 16" x 16') box with 3" of 2lb density foam insulation used as a refrigerator in the tropcis will use 25amp/hours @ 12 volts per day. A 8 cubic foot (24" x 24" x 24") box with 3" of 2lb density foam insulation used as a refigerator in the tropics will use 57 amp/hours @ 12 volts per day. A 15.6 cubic foot (30" x 30" x 30") box with 4" of 2lb density foam insulation used as a refrigerator in the tropics will use 68 amp/hours @ 12 volts per day. The water cooling option, added to the air cooled system, incorporates a copper-nickel tube-in-tube condenser. A remote pump, elected by a switch on the cabinet, operates with the compressor and fan. Water cooling should be used in engine room or other confined installations. This type of condenser utilizes the scrubbing effect of water and is far more efficient than static water cooling. 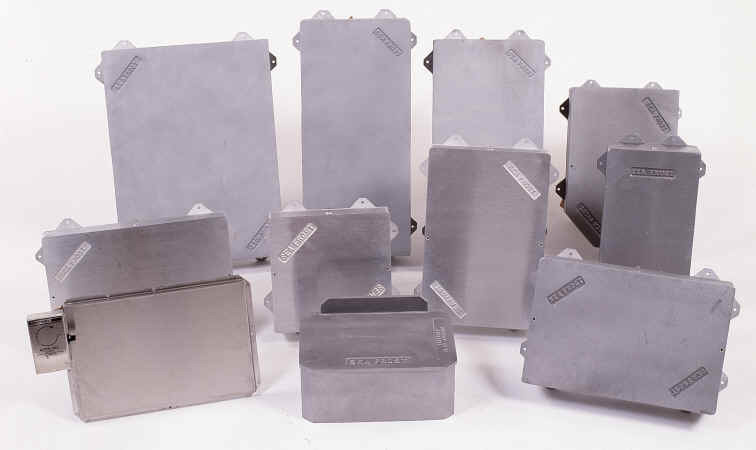 BD systems use thin (half-inch), stainless steel cold plates, available in many sizes. These direct evaporator plates provide excellent thermal conductivity for cooling efficiency. They're mounted on stand-offs to allow air to flow on both sides. Refrigerators require a single plate which should be mounted as high as possible in your insulated box. Approximately 20% of the wall area should be covered. 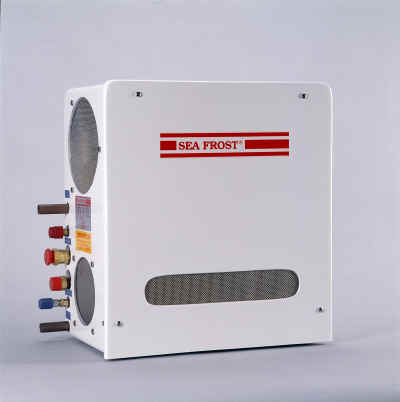 Sea Frost Bait Freezers (BF Series) are compact, 110 or 220 volt AC powered units adaptable as catch box chillers, bait freezers or galley refrigerators/freezers. These can be bulkhead or shelf-mounted and are capable of maintaining an insulated cabinet below freezing temperatures when operating from a continuous power source. The remote mounted compressor and condenser are housed in a compact, rust-proof, fiberglass housing. Temperature is controlled with a digital, low-voltage thermostat. Typical freezer installation requires two stainless steel direct evaporator plates (or a hidden cooling coil if the installation is new construction.) Plates are 1/2" thick with sealed backs and are available in custom sizes with stainless steel or copper refrigerant tubes. Models inclue the BF1-1/4hp, air cooled; BF2-1/4hp,either air or water cooled; and BF3-3/8hp, air or water cooled.